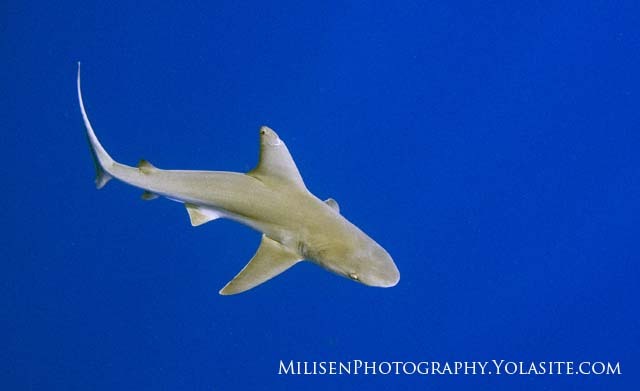 Sharks are some of my favorite sea creatures to work with and photograph. 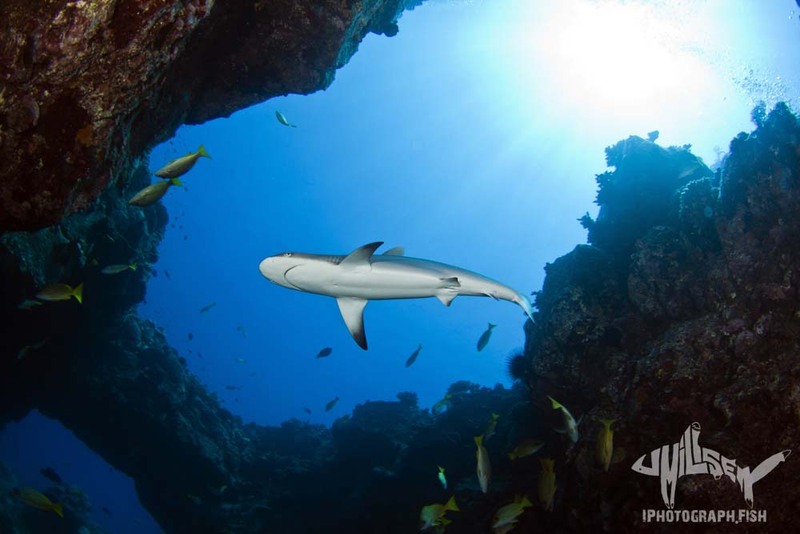 Hawaii has 11 species of shark that occur within easy reach of recreational divers. Many of these can be difficult to distinguish to the untrained eye. Therefore, here is a brief guide to the sharks you may encounter in Hawaiian waters. 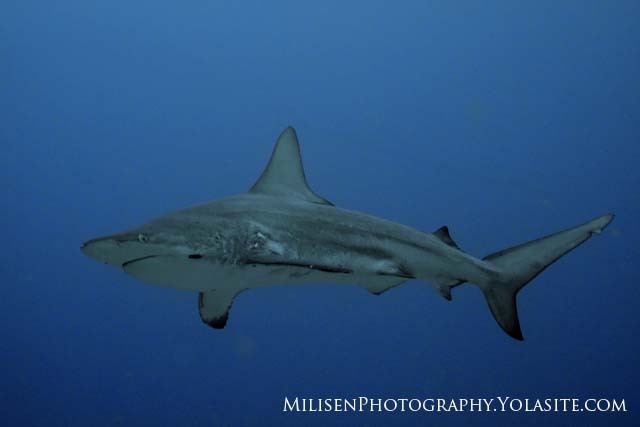 For more sharky images, check out my new shark photo page. Habitat: Shallow coastal reefs. Young often cruise through water so shallow the dorsal fin sticks out. Threat: Low due to its size and timid disposition. 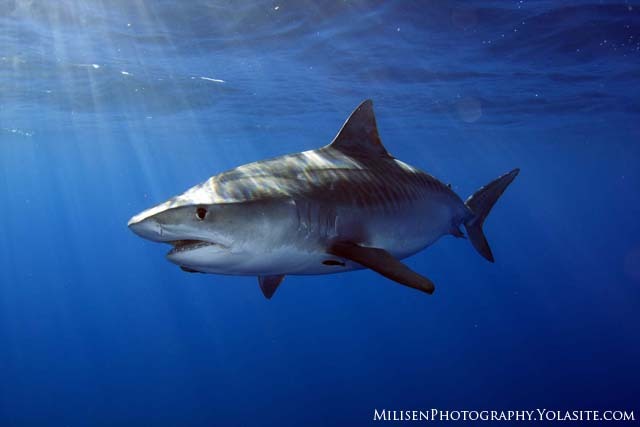 Distinguishing Features: Smaller carcharhinid (to 1.5 meters/5 feet) but with large black tips on its dorsal and caudal fin. 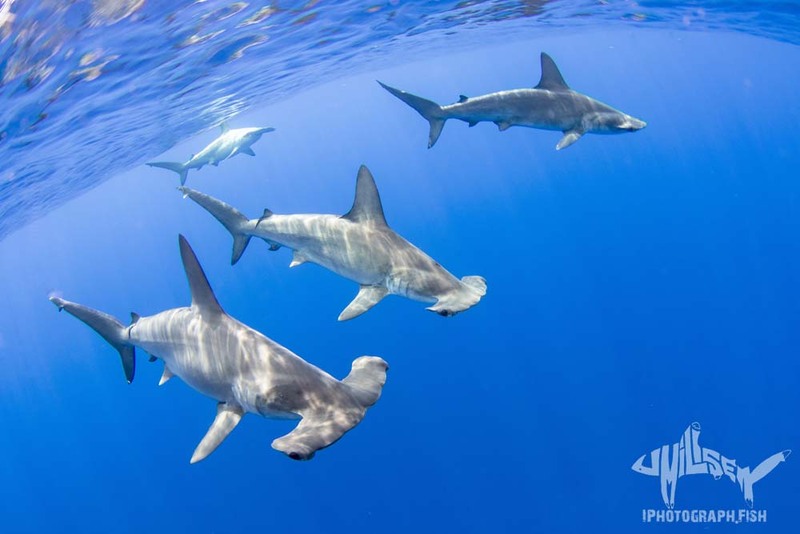 Habitat: Coastal and pelagic species with pups born in shallow bays. 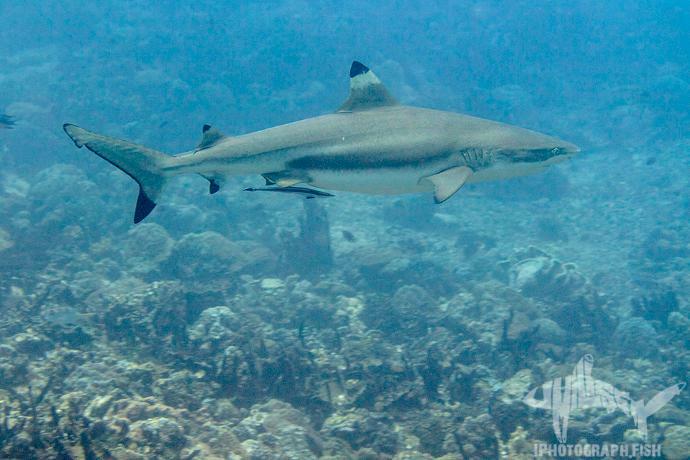 Distinguishing Features: Blacktips are muscular, medium sized sharks (3 meters/9 feet) with black tips on the undersides of the pectoral fins. 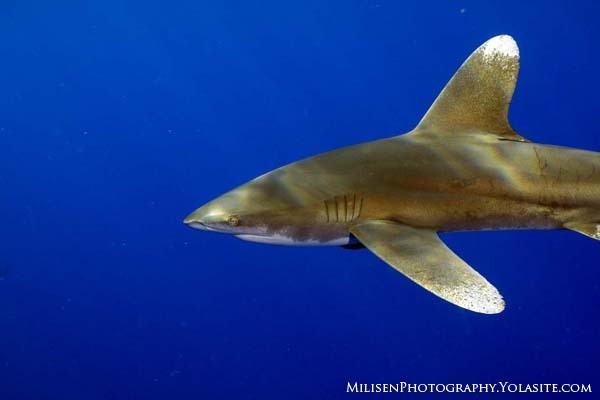 Unlike the blacktip reef shark, blacktips often don’t have obvious black dorsal fin tips and instead usually have pointed first dorsal fins with thin black outlines. They often also have a white stripe extending from the vent to just under the first dorsal fin. Distinguishing Features: Striking blue back, long nose and elongated body form. Habitat: Insular habitats to 600 feet. 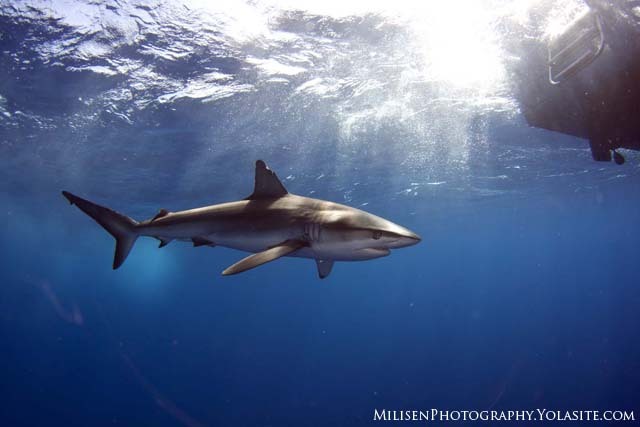 Distinguishing Features: This medium sized carcharhinid (to 3 meters/10 feet) has few distinguishing features except for a darkened (but not black) trailing edge on the caudal fin. Threat: This shark is characteristically very bold and is known to clean up after at-sea disasters. Therefore it should be treated with much respect when encountered. 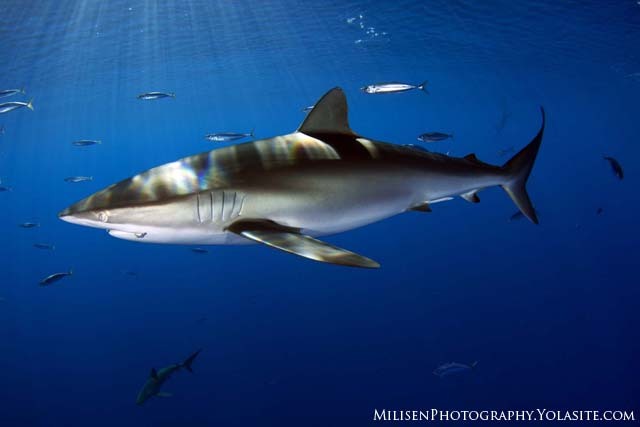 However, due to its pelagic habitat, most swimmers will never see an oceanic white tip. Distinguishing Features: Very large, wing-like pectoral and dorsal fins tipped with large swaths of white. 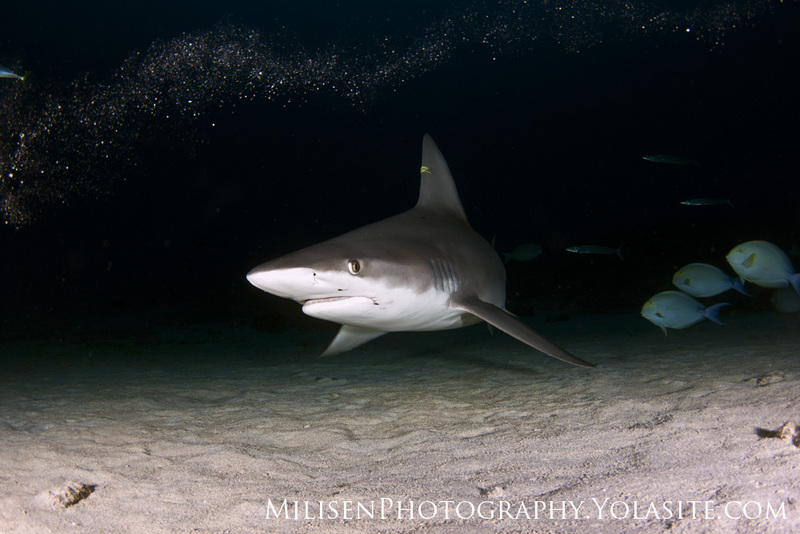 The white fin tips can be visible from many feet away under and above the water. 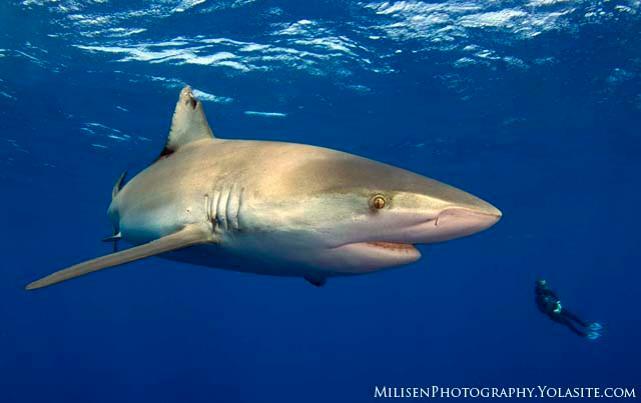 The counter-shading on the head often has a “chin-strap.” Its boldness, distinctive markings and graceful swimming style make it one of the prettiest sharks in Hawaii. 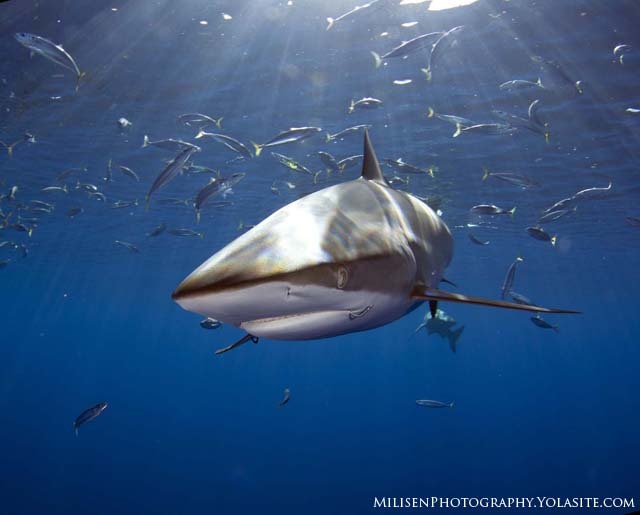 Oceanic white tips grow to 4 meters/12 feet. 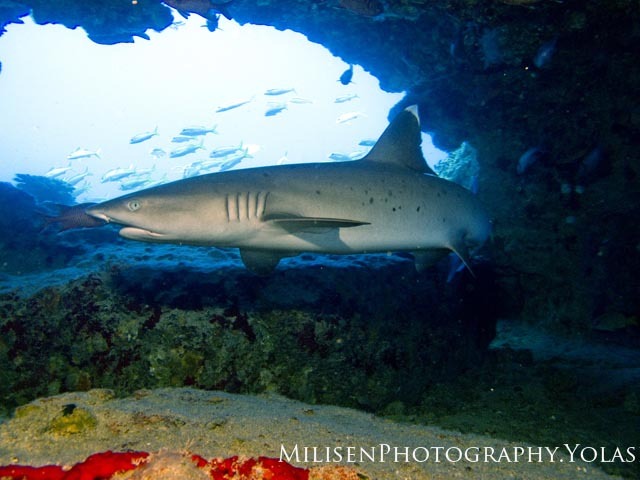 Habitat: This shark tends to inhabit shallow reefs and harbor mouth entrances. Threat: Low to moderate as this shark can be a little curious. Distinguishing Features: The distinguishing feature of sandbar sharks (2 meters/6 feet) is an exaggeratedly large first dorsal fin. They also tend to have light outlines on their pectoral fins. Habitat: Can be found in both coastal and pelagic waters from the surface to 300 meters/900 feet. 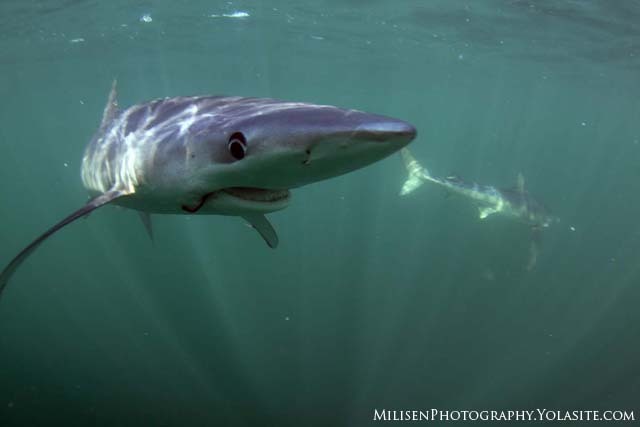 This shark tends to accumulate around sea mounts and in certain areas during the day, then disperses following the earth’s magnetic features to navigate foraging grounds at night. Known to pup inside shallow bays such as Kaneohe Bay and Pearl Harbor. Distinguishing Features: Wide head with five obvious rostral notches from which its name is derived. 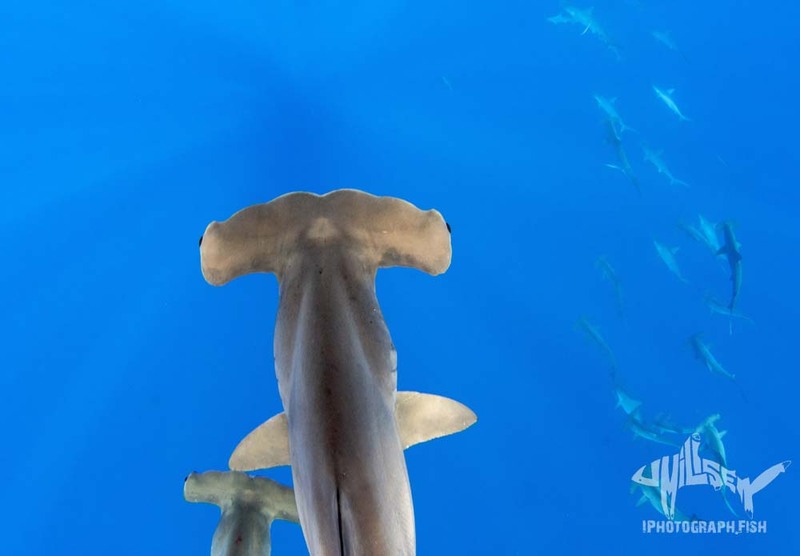 Scalloped hammerheads can attain 4 meters/12 feet. 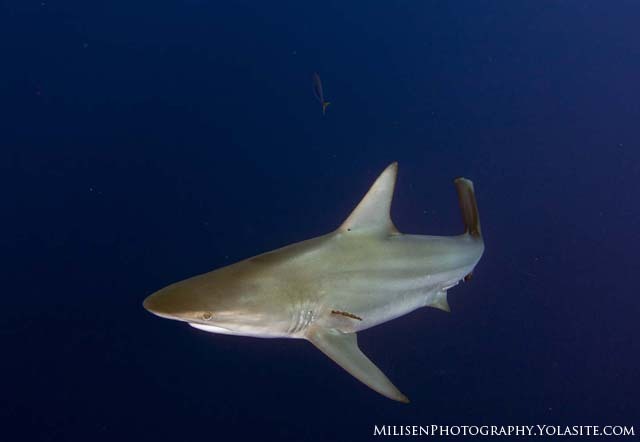 Distinguishing Features: The defining characteristics for a silky shark is a small, rounded first dorsal fin and highly contrasted counter-shading. 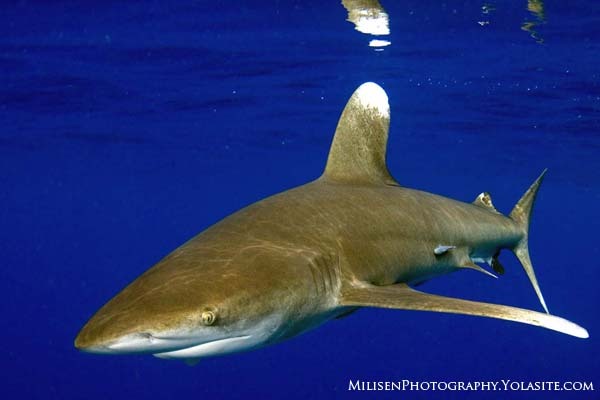 Threat: Considered one of the more dangerous sharks in Hawaii. Its enormous size commands respect. 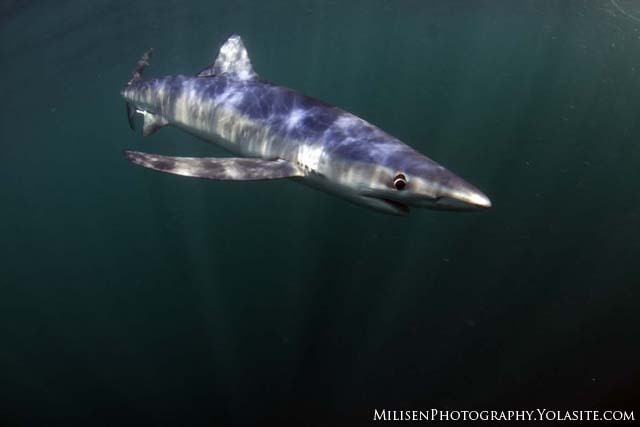 Distinguishing Features: Large, rotund shark (to more than 6 meters/18 feet) with blunt nose, and stripes. 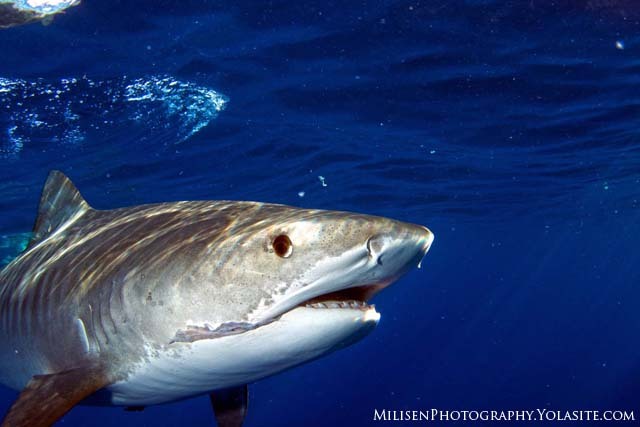 Tiger sharks are difficult to confuse with other sharks. Habitat: Pelagic, usually associated with areas of upwelling. 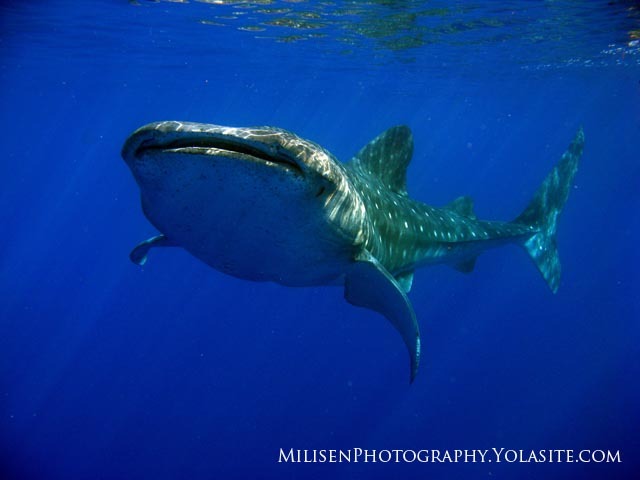 They can often be found off the Kona Coast of the Big Island in winter. 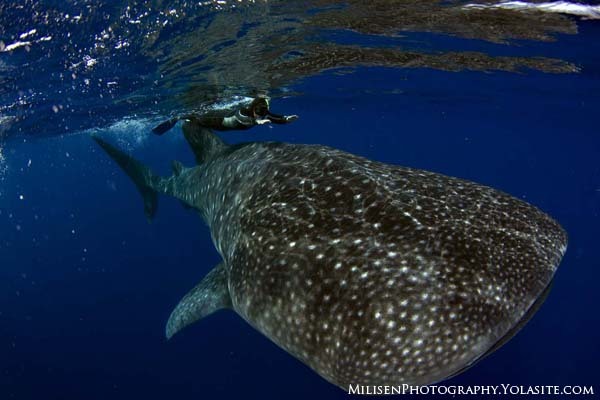 Distinguishing Features: Between their enormous size (15 meters/45 feet), white checkerboard and spot pattern, and broad, flat head, there is no mistaking a whale shark. Habitat: Shallow reefs from the surface to depths of 400 feet. Tends to rest in caves and overhangs during the day and feed at night. 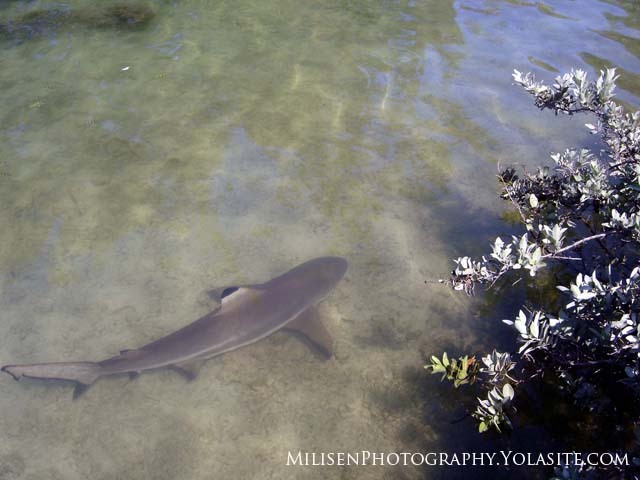 Probably the most common inshore shark in Hawaii. 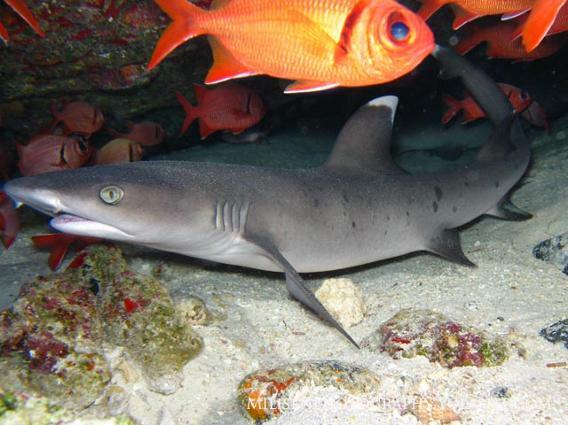 Distinguishing Features: Small shark (to 2 meters/6 feet) with relatively long body and white tips on the dorsal and caudal fins. Small black spots may be present on the body. Habitat: Sticks to current rich coastal reefs but prefers the smaller islands in the Northwestern Hawaiian Islands than larger, basaltic Main eight. Threat: Usually not an issue but can become territorial in some areas and times of year. Distinguishing Features: Look for a black trailing edge on the caudal fin and a white streak on the dorsal. 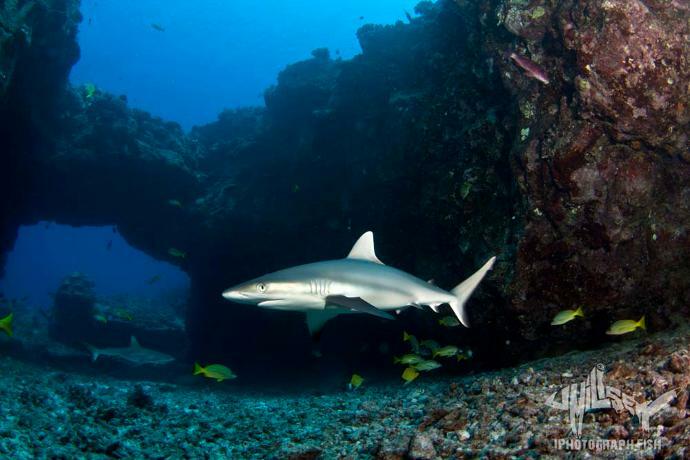 Gray reef sharks can grow to 2.5 meters/8 feet but usually is less than 2 meters/6 feet.